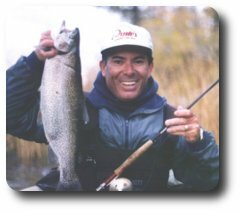 I was introduced to fly fishing while eating lunch with some fellow Times Mirror and Los Angeles Times’ employees over 20 years ago. A friend had just returned from England where he fished several private waters and enthusiastically explained his excitement about his trip and some of the fundamentals of fly fishing. I decided to try a weekend class that Marriott’s was offering and, after the classroom training on Saturday, managed to catch a few small trout on Sunday in the west fork of the San Gabriel. From that time on I knew I was hooked on this great sport. FFCOC has been a terrific club for meeting good friends, sharing outing experiences, and learning about all aspects of fly fishing. I am still hoping for more time on the water to really improve my knowledge and skill levels. Let’s hope those opportunities come sooner rather than later.